Alright fine. Maybe these black and gold howler monkeys are not Whitney Houston and they don't think veganism is whack but new observation had shown that these howler monkeys actually raid chicken coop (or bird nests) for eggs. Yes, for food not to paint Easter eggs. Thought to be exclusively folivores, the black and gold howler monkeys (Alouatta caraya) feed mainly on leaves, fruits and other parts of the plants such as flowers and bark. However, the population of black and gold howler monkeys in the forest of Rio Grande do Sul, Brazil had been observed eating eggs. "Alouatta is the most studied New World primate genus in the wild and there is not a single observation of intentional ingestion of animal matter in the literature", said primatologist Dr. Julio Bicca-Marques. In 2005 Ms Helissandra Prates, a student of Dr Bicca-Marques, observed two juvenile black and gold howler monkeys (Alouatta caraya) licking the interior of a dove's nest at Estancia Casa Branca, a 2 ha orchard forest in Alegrete. The nest contained a broken egg shell. She later found evidence of egg remains in howler monkey dung collected from the orchard floor. Then in 2007, Ms Muhle, another of Dr Bicca-Marques's students, witnessed howler monkeys eating birds' eggs at a separate woodland site at Beco Xavier. Over an eight month period, she recorded 19 separate instances of egg predation by a group of five individuals. All these later cases involved chicken eggs, which the monkeys stole from a chicken coop. While all five monkeys were seen to enter and investigate the coop, most of the eggs were actually eaten by a single subadult male. - Walker M. 2009. Monkeys 'reject vegetarianism'. BBC. The evolution of egg-eating is localized in this population, leading researchers to think that it is a response to environmental conditions. There is a high density of howler monkeys living in a habitat with low food sources. Bicca-Marques et al. think that eggs act as a surrogate supplementary source of protein because of the low food diversity. The shift from folivory to omnivory reflects the flexibility of the black and gold howler monkey's diet. Watch the video of a black and gold howler monkey raiding a chicken coop. Dr Julio Bicca-Marques and her colleagues from the Primatology Research Group published their findings in the International Journal of Primatology. The paper, "Habitat Impoverishment and Egg Predation by Alouatta caraya" is available in .pdf form through SpringerLink for free. 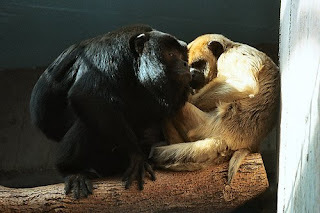 A quick Google search reveals that local zoos feed their black and gold howler monkeys meat and eggs such as Connecticut's Beardsley Zoo. Interesting. Coincidence? This finding reminds me of the dietary shift and exploitation of new food sources in chimpanzees. We know that Gombe chimpanzees (Pan troglodytes schweinfurthii) prey on red colobus monkeys (Colobus badius tephrosceles) (Stanford et al., 2005) while savanna chimpanzees (Pan troglodytes verus) from Fongoli hunt lesser bushbabies (Galago senegalensis) using spear-like tool (Pruetz and Bertolani, 2007). Will we see more published paper about dietary shift and exploitation of new food sources? I guess it would have to be a trend as these primates lose more and more of their food sources and habitat. Perhaps those with a flexible diet will better adapt to their changing environment and ecology. Sorry PETA. It seems that omnivory is in and veganism is out. Bicca-Marques JC. Muhle CB. Prates HM. De Oliveira SG. Calegaro-Marques C. 2009. 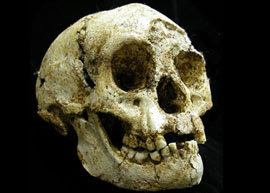 The controversies over the hobbits or Homo floresiensis just refuse to end. It seems that the hobbits might not be a Homo after all. I guess they found the index and ring fingers of the hobbits (Sorry, inside joke. Read this post if you want). Homo floresiensis (LB1) skull. Photo from Science Museum. 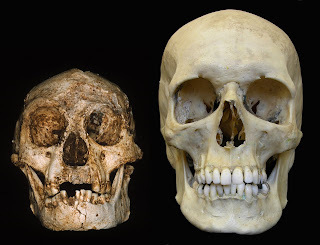 Homo floresiensis, LB1, skull (left) and human skull (right). Photo from BBC. Anyway, Peter Brown from the University of New England who first described Homo floresiensis said that he is considering of stripping the hobbits from the genus Homo. Brown and his colleague, Tomoko Maeda, said that the Homo floresiensis lineage possibly left Africa before the evolution of the genus Homo. Their paper had been accepted and will be published in an upcoming special Homo floresiensis edition of the Journal of Human Evolution. I can't wait for the paper to come out. In the meantime, you can read this article from The Australian. A baby white-handed gibbon was born at Vienna's Schoenbrunn Zoo to father Robert (aged 11) and mother Sipura (aged 21) on Sept 23rd. 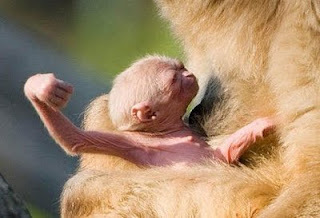 The baby was dubbed "ET" by the Vienna media after the famous Hollywood blockbuster alien although the zoo does not have an official name for the baby yet. Isn't he adorable? I can't stop saying "awwwwww". "ET" snuggling with his mother. Photo from Austrian Times. 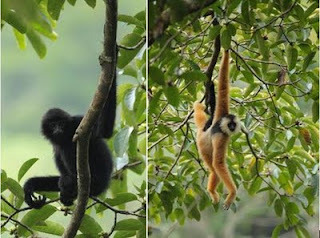 Two new protected areas were designated in China and Vietnam recently to protect two of the world's most endangered primates by Fauna and Flora International (FFI). The Tonkin snub nosed monkey (Rhinopithecus avunculus), found only in Vietnam, numbers about only 200 individuals in the wild while the eastern black crested gibbon or cao vit gibbon (Nomascus nasutus), second most endangered primate in the world, numbers only just 110 individuals. Both species are listed as "critically endangered" in the International Union for Conservation of Nature (IUCN) Red List. The Tonkin snub nosed monkeys were thought to be extinct until a small population was rediscovered in the early 1980s. Read more about the Tonkin snub nosed monkeys, cao vit gibbons and the new nature reserves from Wildlife Extra. Male (left) and female (right) cao vit gibbons. Photo from Fauna and Flora International. The Tonkin snub nosed monkey. Photo from Fauna and Flora International. Can I See Your Fingers Please? That is what University of Liverpool's Emma Nelson probably would have said if she were to meet our hominan ancestors in person. Known to hold true in anthropoids (humans, apes and monkeys), the index (second digit) to ring (fourth digit) fingers ratio or 2D:4D is an indication of how much an individual were exposed to androgen (such as testosterone) in the womb. The more androgen you are exposed to, the longer the ring fingers are (and the shorter the index fingers are compared to the index fingers). 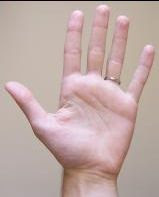 Photo of a human's left hand. From left to right: thumb, index, middle, ring and little finger. Photo modified from Wikipedia. Nelson et al. believe that a high ratio (longer index finger, shorter ring finger) suggests monogamy (or pair-bonded) while a low ratio (shorter index finger, longer ring finger) suggests polygamy (or non pair-bonded). Simply put, individuals with high androgen level is likely to be non pair-bonded and the telltale sign is in the index and ring fingers. Also, some controversial studies had suggested that both men and women who receive high levels of androgen in the womb are more likely to be stronger, faster, and more sexually competitive. Nelson and her researchers recently looked at the fossils of two Neandertals and one Australopithecus afarensis with complete index and ring fingers to determine their 2D:4D. They found that Neandertals had long ring fingers, suggesting that they were polygamous just like modern day primates that live in groups. A. afarensis on the other hand, had long index fingers. Nelson is puzzled by this discovery. "These were small creatures that probably lived in groups and were being eaten by predators. How do you keep from mating with different members of the group? ", she said. Indeed it does not make sense for A. afarensis to be monogamous if they live in groups. Notice that Nelson et al. only used one A. afarensis fossil to get the 2D:4D. Perhaps it is not their fault that only one A. afarensis specimen had complete index and ring fingers but such are the dilemma of using fossil specimens to generalize a whole species.The result might just be a statistical outlier. However, I can't speculate the result or the implications but anyone that are familiar with statistical data knows that a small sample size leads to a higher sampling error. Also what would a 2D:4D = 1 (same index and ring finger length) be? I do find both Nelson et al. and Robinson and Manning (2000) research interesting but I would like to stress that the results are mere predictors and correlations. Take it with a grain of salt. Don't go measuring 2D:4D of your future spouse, boyfriend or girlfriend and accuse them of not being monogamous or a homosexual. Emma Nelson and her team presented their research at this year's Society for Vertebrate Paleontology meeting held in Bristol, United Kingdom. Read more about Emma Nelson's research. Frans de Waal: A Helping Hand Or A Stab In The Back - Which Is More Human? Dr. Frans de Waal will be having a lecture and book signing tomorrow (Thurs, Sept 24) , 7pm at The Kaye Playhouse at Hunter College. For all you Facebook users, Dr. De Waal has a Facebook fan page as well! You really should go become his "fan" on his page. Really. A Helping Hand Or A Stab In The Back - Which Is More Human? World-renowned primatologist Dr. Frans de Waal will discuss his ground-breaking book The Age of Empathy: Nature's Lessons for a Kinder Society. An exploration of the origins of human morality that challenges many of our most basic assumptions, The Age of Empathy has been written by one of the world's leading primatologists, Dr. Frans de Waal, called one of the world's 100 most influential people by Time magazine and the winner of the Los Angeles Times Book Award. De Waal's newest book looks at the question of whether competitive, selfish behavior is really "instinctive" and "natural," an outgrowth of evolution and the survival of the fittest. However, using research from anthropology, psychology, neuroscience, and animal behavior, de Waal argues that humans are equally hard-wired for empathy. We are, he says, group animals - cooperative, sensitive to injustice, and mostly peace-loving - just like other primates, elephants, and dolphins. De Waal's findings have profound implications for politics, office behavior - and perhaps our very survival. To RSVP, click here or call (212) 772-4007. A little boy pressed his nose on the glass where a Western Lowland Gorilla is interacting with the zoo-goers. He turns around to his parents with a big smile. “Oh look, the monkey wants to kiss you”, said his mother. At the lemur exhibit, a girl asks her parents what those black and white primates were. Her dad picks her up and said, “It’s a monkey, sweetie … let’s go”. A pair of gibbons gracefully swings around in their exhibit. Excited, a group of kindergarteners cheered as these gibbons maneuver around its habitat with great agility. “These monkeys are so active”, said the teacher. If this sounds familiar to you then you are not alone. I spent a great deal of time near primate exhibits mainly because I love to observe their behaviors. I also enjoy watching interaction between humans and primates. However, there are times when I just can’t control myself and felt compelled to walk over to these people and explain to them that the word “monkey” is not a general term for primates (politely, of course). It shocks me that most of the time people do not read the information panel at the exhibit (aren’t zoo trips for educational purposes?). So when is a monkey really a monkey? Monkey is a colloquial term for any cercopithecoids (Old World monkey) and platyrrhines (New World monkey). Monkeys are not hominoids (apes) or prosimians. One of the most distinctive characteristic that differentiate monkeys and apes is the presence of a tail in monkeys. 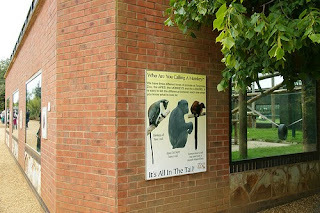 Gibbons, siamangs, orangutans, gorilla, chimpanzees and bonobos are apes because they do not have a tail. 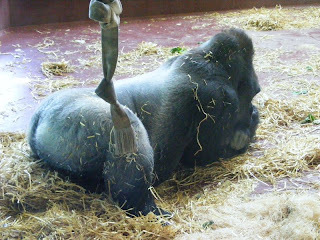 Gorillas do not have tails, so they are not monkeys but apes. Differentiating monkeys and prosimians are a little tricky; all prosimians have grooming claws (toilet claws) but it is generally not visible within zoo exhibits. Prosimians include lemurs, lorises, galagos, aye-ayes and tarsiers. A ring-tailed lemur is a prosimian. 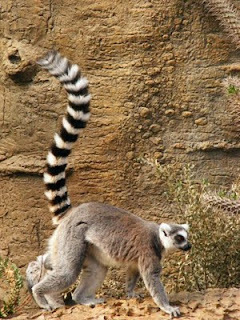 Although it has a tail, it also have grooming claws so lemurs are not monkeys. 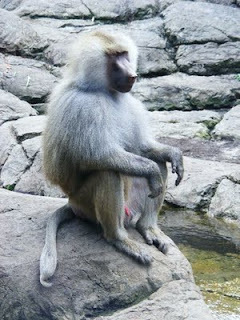 A hamadryas baboon is technically a monkey because it has a tail but has no grooming claws. The Barbary Macaque, Macaca sylvanus, was formerly named Barbary Ape due to the absence of a tail (to be more precise, they have a vestigial tail that looks like a stump). However, we know now that it is more closely related to macaques than to apes so its name was changed to correctly reflect what they are. 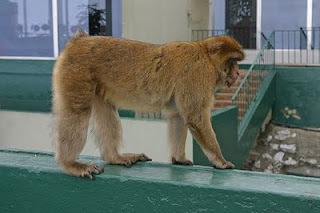 A Barbary Ape (notice the lack of tail). Flickr photo from Gerald Davison. This brings us back to the question, “when is a monkey really a monkey’? The most straightforward answer would be “when it has a tail but doesn’t have grooming claws”. However, the most convenient answer usually lies in front of you … on the information panel. Flickr photo taken by tim ellis at the Twycross Zoo, England. The sign reads "Who are you calling a monkey?" Algeripithecus and Azibius: Anthropoids or Strepsirhines? The mandible of Algeripithecus. Photo from Science Daily. The debate for the origin of anthropoid points to two locations. One hypothesis supports the notion that anthropoids originated from Africa while the other argues that anthropoids originated from Asia. The model for the African origin hypothesis rests on Algeripithecus minutus, a fossil discovered in Algeria, Africa that lived 45 million years old. Algeripithecus and Azibius are Eocene primates that lived around the same time in Africa some 50 million years ago. Much more complete craniodental fossils of Algeripithecus and Azibius were recently excavated and reveal that they might not be anthropoids but were strepsirhines instead. New data from the fossils, according to a recently published paper by Tabuce et al. (2009), suggest that Algeripithecus and Azibius were the earliest primates to branch out of the Afro-Arabian strepsirhines clade. According to Tabuce et al. (2009), there are anatomical evidence suggesting that Azibius were nocturnal. They also found that Algeripithecus has a long, thin and forwardly inclined lower canine alveolus, features that match the long and and flat lower canine in the tooth comb (dental comb) of crown strepsirhines. These physical characteristics suggest that both Algeripithecus and Azibius are closely related to crown strepsirhines. The researchers concluded that both Algeripithecus and Azibius were not members of the anthropoid family but instead an early representative of the crown strepsirhines. Crown strepsirhines gave rise to modern day lemurs, galagos and lorises. Tooth comb of a ring-tailed lemur (Lemur catta). Notice the two lower canines that are long, thin and forwardly inclined. 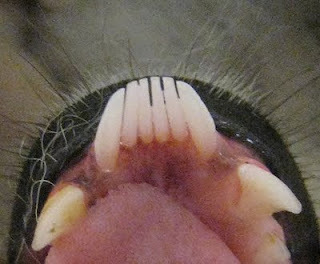 Together with four lower incisors, it makes up the tooth comb. Photo from Wikipedia. 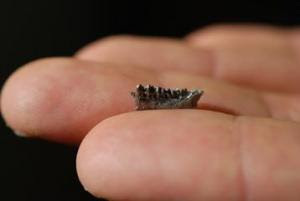 These recently excavated fossils support the origin of crown strepsirhines from Africa. However, it also challenges the hypothesis that points to Africa as the origin of anthropoids since Algeripithecus should be classified as strepsirhines instead of anthropoids (and no longer provide evidence for the Africa origin hypothesis) according to this published paper by Tabuce et al. Rodolphe Tabuce, Laurent Marivaux, Renaud Lebrun, Mohammed Adaci, Mustapha Bensalah, Pierre-Henri Fabre, Emmanuel Fara, Helder Gomes Rodrigues, Lionel Hautier, Jean-Jacques Jaeger, Vincent Lazzari, Fateh Mebrouk, Stéphane Peigné, Jean Sudre, Paul Tafforeau, Xavier Valentin, and Mahammed Mahboubi. Anthropoid versus strepsirhine status of the African Eocene primates Algeripithecus and Azibius: craniodental evidence. Proc R Soc B 2009 : rspb.2009.1339v1-rspb20091339. New this year is The American Anthropological Association (AAA)'s Student Saturday , a Graduate School Fair for undergraduates and graduates to network learn how to "sell yourself", attend workshops essential to apply for graduate schools, etc. Note that the last day to register is October 16, 2009. The AAA also prefer that you contact your department for a contact person to send in all the forms and payments although you can personally send it in yourself. Do you plan on going? I'll be there so if you see me, say hi! Animation of chimpanzee yawning from Emory University. Illustration from BBC News. I'm sure we are all familiar with this scenario: Someone yawns and we would "catch" it or vice versa. This is the phenomenon of contagious yawning. A new paper from The Proceedings of The Royal Society "Computer animations stimulate contagious yawning in chimpanzees" suggests that the phenomenon of contagious yawning and empathic response to animation occurs in chimpanzees. Computer animations of yawning chimpanzees (see illustration above) can be use to stimulate contagious yawning in chimpanzees. Previous researches have documented contagious yawning in chimpanzees through video-recorded footage. 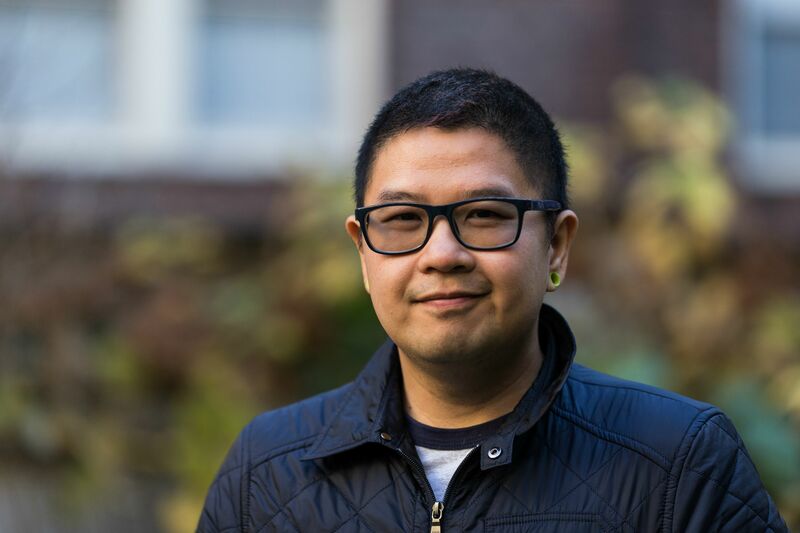 Dr. Matthew Campbell, lead author of the paper from Emory University's Yerkes National Primate Research Center said that they would also like to learn more about behaviors that are related to empathy such as consolation (when an individual does something nice to the victim of aggression). They want to know if individuals that are good contagious yawners are also good consolers. Understanding how chimpanzees empathize and imitate animations can help us understand how we, as human beings, empathize and imitate animations as well, said Dr. Campbell. Jane Goodall's New Book, "Hope for Animals and Their World: How Endangered Species Are Being Rescued from the Brink"
Jane Goodall's new book, Hope for Animals and Their World: How Endangered Species Are Being Rescued from the Brink. 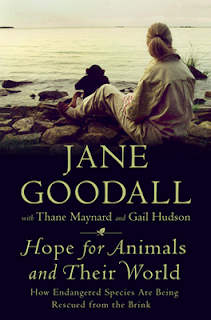 I was at The Union Square Barnes and Nobles yesterday evening for Jane Goodall's book signing. She, along with Thane Maynard (Cincinnati Zoo director) and Gail Hudson (author of Harvest of Hope), was there to give a brief talk and sign her new book Hope for Animals and Their World: How Endangered Species Are Being Rescued from the Brink. I have yet to read the book but a chance to meet her in person (even for 1 minute) was exciting for me. I must admit that I was kinda shaking (again, with excitement) when I told her she's a great inspiration though she just looked at me slowly and smiled. She's pretty much the Whitney Houston of primatology, so she needs her diva moment. I will write more about the book once I am done with it. I'm sure most people associate Jane Goodall with chimpanzees and primatology, but did you know that along with Dian Fossey (studied mountain gorillas) and Biruté Galdikas (studies orangutan), they are referred to as "Leakey's Angels"? Yes, Leakey as in Louis Leakey, the famous archaeologist who worked at Olduvai Gorge and discovered Oldowan tools. 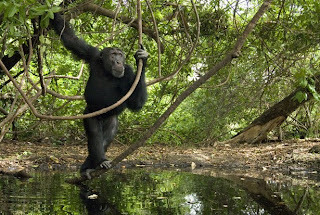 A Fongoli chimp. Photo by Frans Lanting, National Geographic. I just stumbled upon this on Twitter (Thanks to DarwinMonkey). It's a National Geographic page about the Senegalese Fongoli chimps, named after the Fongoli stream that runs through the chimpanzee's range. There are videos showing these chimps using tools fishing for termites, hunting a bushbaby and taking baths. Mary Roach's field note-like article "Almost Human" offers readers an insight to what the daily life of a chimpanzee is like (the Fongoli chimps are savanna-woodlands chimp), the concept of "ecological intelligence" and innovative tool use by the Fongoli chimps that were suppose to be unique to humans. Read about "Almost Human" on National Geographic. Soon Facebook and Twitter users can "friend" and "follow" Uganda's mountain gorillas (Gorilla beringei beringei) and see videos of them feeding, receive regular updates on the status of these gorillas and even updates on new births. Lillian Nsubuga, a Wildlife Authority spokeswoman, said that this is to promote Uganda's tourism industry. 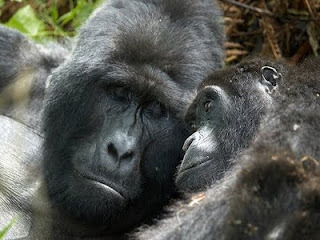 Aside from Uganda, mountain gorillas can only be found in two other countries; Rwanda and The Democratic Republic of Congo.